119 Crescent Road, Corte Madera — Ideally located at the foot of coveted Christmas Tree Hill, this lovely contemporary home offers privacy, views, outdoor living, walk-to-town convenience and award-winning schools. Featuring an open floor plan, 4 bedrooms, 3 full baths and 2 family rooms, this home is perfect for families or professional couples who work from home or who desire an easy commute to San Francisco. 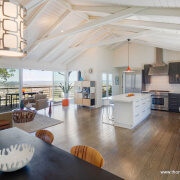 The open-concept living/dining area just off the kitchen features gleaming hardwood floors, bright skylights, a cozy wood burning fireplace and beautiful views. Sliding glass doors open out to a deck that overlooks the valley with partial bay views. The updated kitchen boasts stainless appliances, including a gas cooktop and double ovens, Zodiak quartz counters and ample cabinet space. The kitchen opens out to a side garden ideal for barbecuing and morning coffee. The spacious master suite with large walk-in closet and ensuite bath is located on the main floor along with two additional bedrooms and second full bath. The lower level includes the fourth bedroom and third full bath as well as a second family/media room that flows outdoors. Just outside the second family room is a private outdoor oasis which includes a hot tub, shower and multiple outdoor rooms ideal for entertaining, relaxation and play. Mature landscaping and a variety of greenery add to the secluded feel in the backyard. Just a short walk to Corte Madera Drive / Magnolia Avenue, this home is well-situated to take advantage of all that Corte Madera and Larkspur have to offer. Walk to dinner at Burmatown, workout at TJ’s Gym or have a glass of wine at Zinz Wine Bar. Enjoy the free summer Sunday concerts at Piccolo Pavillion in Menke Park. There is no shortage of nearby hiking, biking and nature walks. There is also a neighborhood block party each Labor Day. The charming town of Corte Madera (map) lies at the foot of legendary Mt. 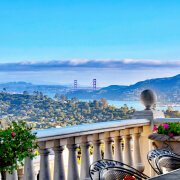 Tamalpais and is a wonderful blend of contrasts from a 620-acre ecological preserve to exclusive shopping centers and from waterfront homes to grand estates tucked into the hills above the town. There is truly something for everyone in Corte Madera. 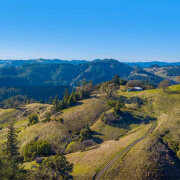 Located just 12 miles north of San Francisco, Corte Madera offers its 9800 residents a 22-acre recreational park, a historic village square and numerous biking paths. These amenities as well as the area’s central location, friendly neighborhoods, great schools and easy commute make Corte Madera a very popular place to live. Front Entry to 119 Crescent Ave. Kitchen Cafe Area Perfect for Morning Coffee!